What if, as has long been thought, spirits – of the dead or otherwise discarnate – were real? I ask, if only to challenge current assumptions, or, should we say, taboos? People invoke Occam's Razor at the drop of a hat, usually to cut through other people's arguments and champion their own. So if we were to do that now, what would be the simplest and most elegant solution to the problem of the paranormal? Spirits – dead, discarnate or otherwise – spirits have the day. So why do we, in the main, reject them? People may argue that spirits have no place in materialistic science. Indeed they do not. But that is not necessarily because science is materialistic. After all, materialistic science has given us Quantum Mechanics and String Theory, and all the rest, things far stranger than Horatio dreamt of in his philosophy, or chosen belief system. I have never been a fan of Occam's Razor. It is just a rhetorical device. Even so, it still leaves us with the problem of spirits. Dr Broughton also observes that the ‘decline effect’ so rampant in parapsychology is not parapsychology's problem alone. When previously established scientific results can no longer be replicated it leaves one with the curious feeling of falling, like Alice, down the rabbit hole. As you read on in this issue, that feeling will only get worse. Dr Terence Palmer has written up the paper he presented at last year's SPR Conference on the subject of the science of spirit possession. Making some enquiries into the names he mentioned, I was delighted to receive an article from Dr Alan Sanderson, one of the pioneers of Spirit Release Therapy in the UK. Their case studies make alarming reading. The cases stack up. Jack Hunter and Dr David Luke have graciously allowed me to reproduce an excerpt from their new anthology, Talking With the Spirits: Ethnographies from Between the Worlds, that showcases the diversity of contemporary spirit mediumship. The theoretical underpinning of this collection is to take these experiences seriously. Collector Brandon Hodge joins us again with the first of his new series on spirit communication devices. It is a necessary historical reminder of the importance of ‘spirits’ in the ostensibly disenchanted, modernised, mechanised and now digitised West. We are forced to reflect – and the venerable history of this Society will not let us forget – that the spirits are not something confined to the exotic cultures that were once the mainstay of anthropology. We should take the cases studies offered by Palmer and Sanderson seriously, too, even if ‘spirits’ is not the answer we want to hear. Down the rabbit hole things can only become stranger. Dr Richard Broughton considers whether mainstream science is finally catching up with parapsychology and what that means for our grasp on reality. Robert McLuhan, Commissioning Editor of the new Buckmaster Publications Project, explains what it is and what it means for the future of psychical research. Dr Terence Palmer takes us on a personal journey to his discovery of Spirit Release Therapy and outlines the findings from his book, The Science of Spirit Possession, now in its second edition. Dr Alan Sanderson, a pioneer of Spirit Release Therapy in the UK, presents a powerful case study and asks what we can learn from it. From Wild Beasts of the Philosophical Desert to The Secret History of the Soul, explore four exciting books. Dr David Luke and Jack Hunter give us an extract from their new book Talking With the Spirits. Dr Leo Ruickbie reviews the online conference ‘Parapsychology and Psychology: Research and Theory’. Ron Pearson explains how his new ‘wisdom of the crowd’ prediction experiment hopes to find out when the Yellowstone Supervolcano will erupt. Callum E. Cooper takes us with him to visit the famous Rhine Research Center, including an interview with Alice Kelley, the niece of Dr Alex Tanous. Dr Matthew Colborn presents an overview of the recent SPR Study Day on ‘Psi and Psychedelics’. Johann Baptista and Dominic Parker give us their impressions of last year's Parapsychological Association conference, plus the results of the 2014 Parapsychological Association Awards. Brandon Hodge launches his new column with an examination of the earliest commercial spirit communication devices. From online courses to upcoming conferences, find out what is on the agenda for early 2015. 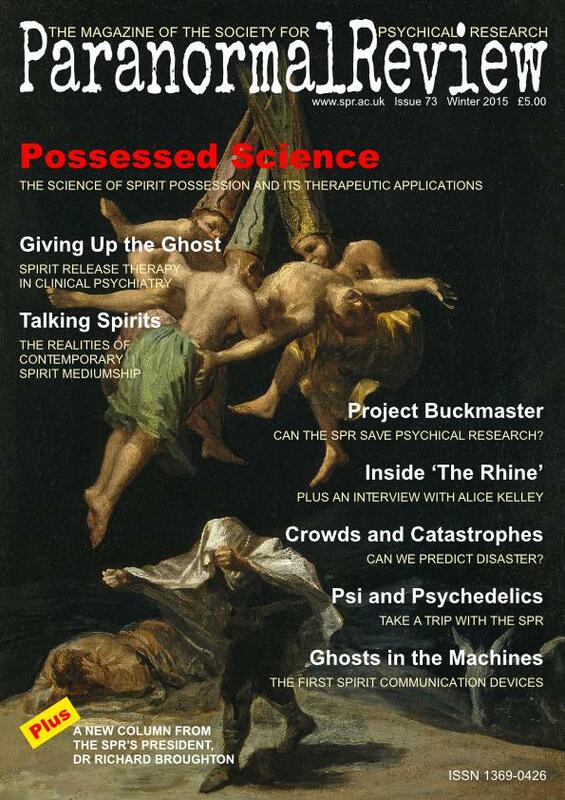 The Paranormal Review is the magazine of the Society for Psychical Research. With cutting-edge articles and features, readers’ letters, personal experiences, notices, reports and announcements, the magazine provides a forum for debate on psychical research, parapsychology and related areas, and stimulates new research through special themed issues. It is printed in full colour and fully illustrated, often publishing photographs seldom or never before seen. It frequently carries offers only available to readers. Priced £5 per issue or £20 per year (including P&P in the UK). Members receive the Paranormal Review free of charge as a benefit of membership.